Art Jacoby was introduced to the game of golf by his father, Armand, when he was ten years old. They spent the next forty years sharing a common passion for the game. In 1975 they finished second in the Philadelphia Father and Son Golf Championship. Their last round of golf together was in Ireland at Royal County Down (recently named the number one golf course in the world). Armand was eighty years old. Jacoby began competing in The Philadelphia Amateur Championship in 1968. After 36 holes of medal play, he advanced into match play and defeated the defending champion, Gordon Brewer, in extra holes. But the highlight of his competitive career came in 1975, when he won The Philadelphia Amateur by defeating Jay Sigel in the semi-finals. Jacoby won the Meadowlands Club Championship in 1968; 1969; 1971; 1973; 1975; and 1977. He won The Philmont Club Championship in 1977. From 1963-1965 he played for The Cheltenham High School golf team, which boasted only one loss during that time. In 1965 he was named captain and won the prestigious Holden award for golf. In the same year, he competed in the PIAA Individual Championships held at Penn State. In college, Jacoby played for the University of Miami Golf Team from 1966-1969 and won the University of Miami Golf Championship in 1968. In his senior year, he transferred to Temple University where he was co-captain of the golf team along with David Brookerson. Jacoby has remained involved with the Temple golf program and also continues to support the First Tee, and J. Wood Platt Foundations. 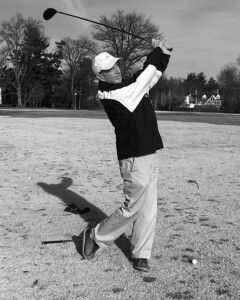 Through the years, Jacoby was also victorious in other Better-ball and team championships including: the North-South Invitational at Philmont Country Club; The Philadelphia Senior Four Man Team Championship; the Senior Bud Lewis Invitational. Jacoby represented The Philadelphia Golf Association in the Annual Mason-Dixon matches against Baltimore/Washington and the Compher Cup matches against The New Jersey Golf Association. He was a member of The Four Man Team from Philmont Country Club, which won the National Cadillac Cup Invitational in both 1988 and 1989.